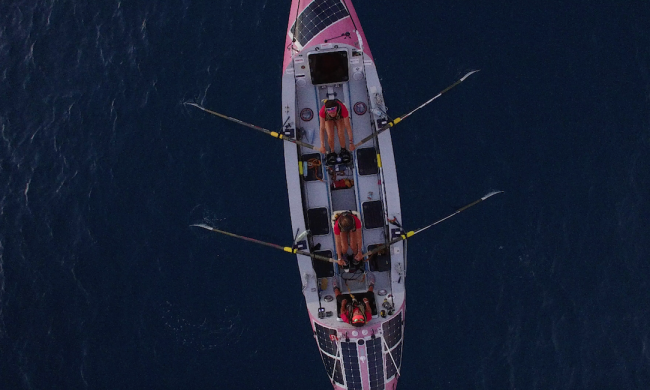 Four women are rowing across the Pacific Ocean. Right now. It sounds crazy doesn’t it? But you read correctly – 4 women in their 20s, 30s and 40s are out in the middle of the Pacific Ocean physically rowing a 29 foot pink row boat called Doris 8,446 miles from San Francisco to Australia. My name is Sarah Moshman and I’m the crazy one who has decided to follow this incredible journey and produce a feature-length documentary about their epic adventure called ‘Losing Sight of Shore‘. 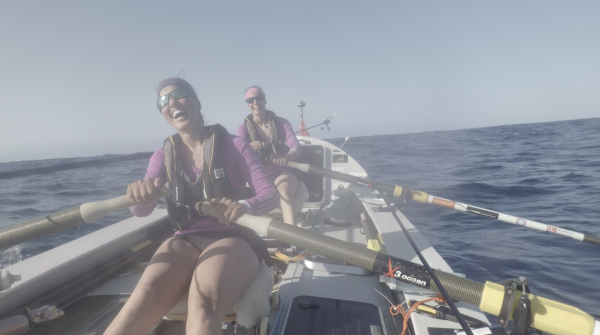 Here are the facts: 4 women who make up the Coxless Crew hailing from the UK and South Africa left San Francisco, CA in the wee hours of April 19th, 2015 to attempt to be the first team of four (men or women) to ever row the Pacific – unsupported. That’s right, there is no follow boat – just these four women rowing 24 hours a day – 2 hours on and 2 hours off day in and day out for over 7 months total. After leaving San Francisco in April, the crew experienced an issue with their MPPT battery and had to turn in to Santa Barbara 16 days in, essentially causing them to start over. Spirits still high and their technical problems fixed, the Coxless Crew once again departed on May 12th, 2015 to set out for Honolulu, the capital of Hawaii. 68 days later, I greeted them in a follow boat a few miles off shore and I couldn’t contain my emotion – it was a mixture of satisfaction, pride and mostly awe. Watching them set foot on land for the first time was thrilling. Leis around their necks, I watched with wonder as they took steps, greeted family and friends, drank champagne, and ate solid food. About 10 days later they set off for the next leg of the journey to Samoa and as of September 21st, they have officially crossed the Equator! If all goes to plan, I hope to see them complete this phenomenal feat by the end of the year. The best part of making this documentary so far has been how much it has changed my life. The Coxless Crew make me want to take risks, dream bigger and aim higher. Their journey is to not only push themselves mentally and physically but more importantly to honor other women that have fought and overcome adversity. They are raising money for Breast Cancer Care and Walking with the Wounded as they row which makes this whole thing that much more incredible. When you meet them, they are humble. They are always in good spirits, and have supported one another in such a beautiful way. For me, this film is important to me for so many reasons. First and foremost, I believe that we need to shine light on extraordinary women especially since there is a severe lack of positive female role models in the media today. My last documentary ‘The Empowerment Project’ taught me that in such a major way. I drove across the United States with a group of all female filmmakers to interview inspirational women from all different industries to talk about gender equality and not being afraid to fail. It has been a joy and a pleasure to show the film in schools, groups and organizations around the country and the world for the past year and a half. So when my friend Fiona Tatton from Womanthology UK (another fabulous blog) asked me if I wanted to be introduced to the Coxless Crew in January of this year, I eagerly agreed. I wasn’t necessarily looking for a new film to make at the time, but once I heard their story – I felt it. I knew there was something special that had just fallen in my lap. Our goals were in line, they felt like sisters, and I wanted to shout from the mountaintop about the scope of their impending journey. With not a lot of time to prepare, I decided to invest my own money in the production of this film which, to be honest, has been equal parts exciting and terrifying. I feel like I started walking on a path having no idea how the road might form underneath my feet, but I believed I would figure it out. And although I still have a ways to go – I can say with confidence I will finish this film and it is going to be great. It’s a good lesson that sometimes you have to invest in yourself before you can expect other people to jump on board (no pun intended). I had to prove to myself, to the Coxless Crew and to the world that I am capable of telling a story on this worldwide scale. To me, ‘Losing Sight of Shore’ won’t be as much about the logistics of what it takes to row an Ocean – although that will be touched on. (Common questions include: what do they eat? How do they go to the bathroom? Do they get along?) But more importantly, this is an amazing story of courage, perseverance and friendship. And the Coxless Crew happen to be women, however their gender doesn’t define the journey. Their motto is “We all have a Pacific to cross.” My Pacific isn’t literal like theirs, it’s to make this film and prove to myself and others what I am truly capable of. Now the question remains: What’s yours? 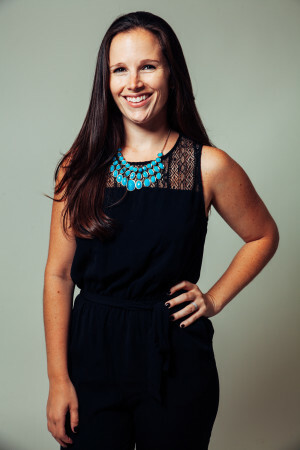 Sarah Moshman is an Emmy Award-winning documentary filmmaker and TV producer. Her first feature-length documentary The Empowerment Project has had a very successful grassroots impact in schools around the country and worldwide as well as won several awards. ‘Losing Sight of Shore’ is Sarah’s second feature-length documentary and she is thrilled to continue to shine light on stories that empower women.